Last week I was lucky enough to be invited to preview Karen Millen’s Christmas collection, which was a gorgeous visual feast of luxury, glamour and opulence. Rich colours and textures were the order of the day –- think aubergine velvet, teal silk and fuchsia faux-fur, combined with luxe design details like petal collars, pleating and ruffles. Pieces were designed to be worn with contrasting tones and set off by statement shoes and accessories that included the most fabulous teal snakeskin boots and zebra studded shoes. 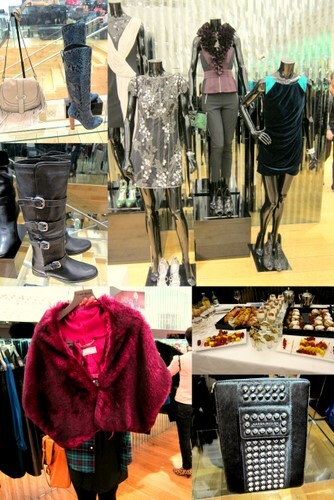 Clockwise from top left: Teal snakeskin platform boots, €399; Christmas party outfits; scrummy breakfast; studded pony skin i-Pad case, €140; oversized faux-fur scarf €140; black biker boots €299. The brand also celebrates its 30th anniversary this year and will be launching an anniversary collection of 30 accessories that includes that wonderful i-Pad case above, along with other studded pony items, a charm collection, croc collection, classic collection and a specially designed black nylon bag for life. What do you think, does any of this tickle your fancy for the festive season? Don't make me fight you for them Kat! LOVING the biker boots. Want want want. THIS much!! But never going to happen at the 300 buck mark!! BOo you mr bank manager!! I love Karen Millens stuff - but alas, it loves me less. I've never found it the most accesible with my body shape. But one can look and dream of elegance such as... and the shoes fit! !